These colourful scarecrows with their fancy spectacles represent the famous comedian, Dame Edna Everage (Barry Humphries). 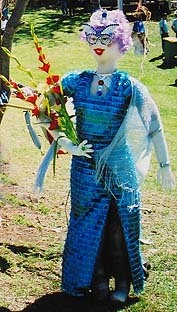 Here is a scarecrow display representing celebrity actor and singer, Will Smith. 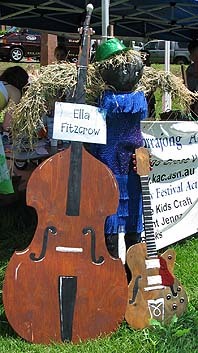 And this scarecrow display shows famous jazz singer, Ella Fitzgerald. Note: This page includes celebrity scarecrow ideas for you and your kids to make: famous actor scare crows, singer scarecrows and comedian scarecrows.